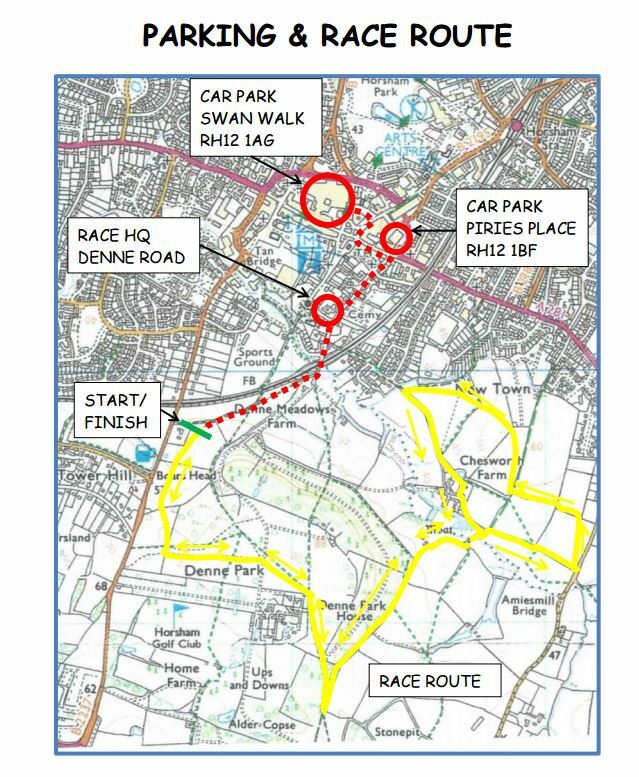 LOCATION: The event takes place on footpaths across open land on the Denne Park and Chesworth Farm estates, close to Horsham town centre. COURSE: Approximately 4.5 miles, undulating, majority off-road course, on bridleways and footpaths. One short section of the course is on a tarmacked driveway, although you can run on the grass verge beside this if you prefer. Water station at finish line. Not suitable for U16s or wheelchair athletes. Disabled runners, please contact Race Director at info@horshamjoggers.co.uk to discuss the course before entering. FOOTWEAR: Depending on weather conditions, the course can get muddy, so trail shoes are strongly advised. TOILETS: Located at Race HQ. No showers or changing facilities. CLOTHING: Because of the likelihood of cold, mud and rain, we suggest you bring a change of footwear and clothing for the journey home. Remember to bring a plastic bag or newspaper for your shoes, to protect the boot of your car! OUTER LAYER DROP-BOX: Runners are welcome to leave bags at Race HQ, but it’s a 10 minute walk to the start, so you might get cold on the way. You can leave clothing (at own risk) at the start/finish area. CAR PARKING: THERE IS NO PARKING AT RACE HQ. Parking is in the public multi-storey carparks at Piries Place, Copnall Way, Horsham, RH12 1BF and at Swan Walk, 3-4 Medwin Walk, Horsham RH12 1AG. Allow 10 mins walk to race HQ and a further 10 mins walk to the start. We rely on the goodwill of local residents so please do not attempt to park near Race HQ. CAKE: A fantastic selection of homemade cakes, savouries, hot and cold drinks are available at Race HQ. All proceeds go to charity.